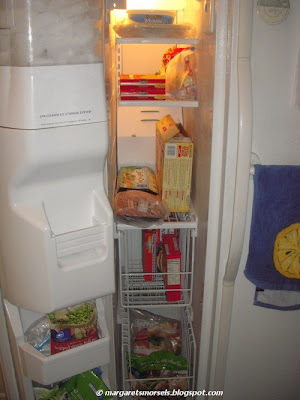 After I posted a blog about a well stocked pantry, several readers emailed and asked what I keep in my refrigerator and freezer. I'm happy to share the information, but it's not as well stocked as my pantry! 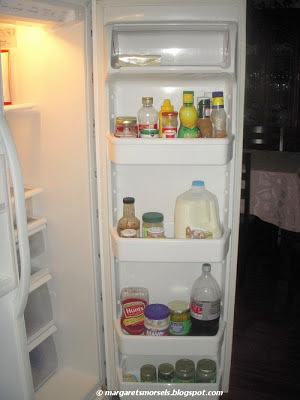 Right now in my refrigerator, I have a variety of condiments -- mayonnaise, catsup, mustard, jelly -- salad dressings, bacon bits, pickles and pickle relish. I also have lemon juice and Parmesan cheese which I use on a fairly regular basis. I also keep a bottle of corn syrup on hand. I don't use corn syrup in a lot of recipes, but I use it enough that I finish the bottle before the expiration date. We drink a lot of milk so there's always one if not two gallons of 1% milk in the refrigerator. Eggs are also a staple at our house as is margarine. Things are a little more interesting in the meat/cheese drawer. I keep a package of bacon on hand. It's great for breakfast, but I also use it in dishes such as green bean bundles, easy stove top beans and marinated pork tenderloin. 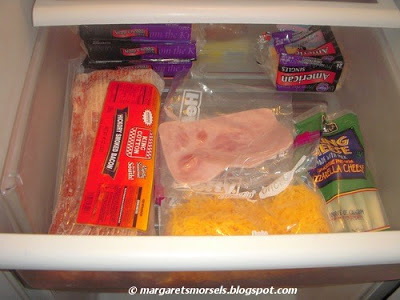 Luncheon meat of one kind or another is in the drawer as is cheese. We love cheese as is evidenced by the packages of Cheddar, American and string cheese! I keep fruit on hand all the time. The day the picture was taken I had grapes, but apples, oranges and fresh pineapple also make a regular appearance in this drawer. The contents of the vegetable drawer change from week to week. There's almost always a package of salad mix and baby carrots. There's no baby carrots in this picture because we finished them a couple of days before the picture was taken. 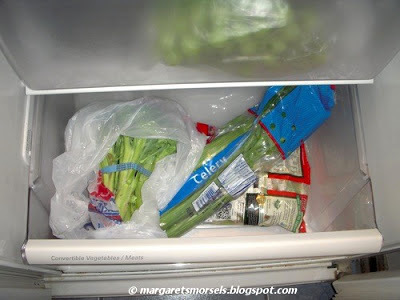 On this particular day, the drawer contained broccoli which was going to be steamed as a side dish plus a stalk of celery some of which was used in a casserole. My freezer compartment isn't very interesting either. I don't make biscuits or pie crusts so I keep a package of each in the freezer, along with a carton of Cool Whip. I try to keep garlic bread, single size servings of macaroni and cheese and several varieties of frozen vegetables on hand. I find it helpful to keep frozen breakfast items on hand for mornings when I don't have time to cook. I keep a one pound package of ground beef in the freezer plus packages of precooked meatballs and precooked country fried steak. These three items are real time savers when plans change and I need to alter the menu on short notice. When it comes to perishables, I prefer to buy them as I need them. 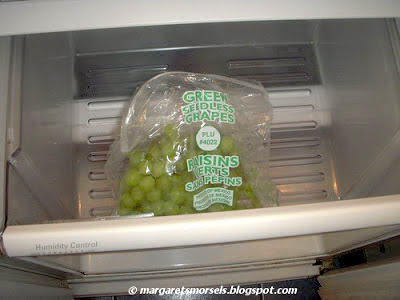 That way, they'll be fresh plus they're not taking up space in the refrigerator. 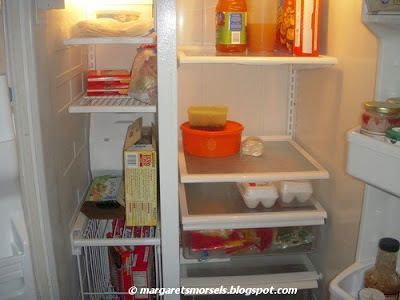 What are your indispensable items for the refrigerator or freezer?